Hello everyone. Thanks for stopping by to read this year’s picture book round-up. I think this was the year of the “wordless” or nearly wordless picture books. So many great titles, three titles made it on to my best of list for this year. If you would like a printable version of this year’s list click here. In keeping with the tradition of last year’s list, I have placed books in “Best of ..” categories. Have a favorite book not on the list, please share the title in the comments along with a best of category title. The zanier the better! Hope you all have a safe and happy holidays! To read an in-depth book reviews click on the book title. Ages 4-10. The new transcontinental railroad in 1869 comes alive as readers take in the sounds, speed, and strength of the mighty locomotives and the American countryside. Kids and adults will be engrossed in the myriad of details in the wonderful narrative non-fiction title. Ages 4-8. Learn about the ecosystem of the rain forest as it relates to the life-cycle of the cocoa tree and why monkeys are so important in making chocolate. Kids will also love the two silly bookworms giving commentary on the non-fiction text at each page spread. Ages 3-6. A charming, deceptively simple book about a young girl and her flamingo friend exploring the ups and downs of friendship through dance. The interactive flaps are a lovely touch and heighten the emotion at every turn. Ages 4-8. Gorgeous. Gorgeous. Gorgeous. Be transported onto a magical journey full of adventure and danger. Where a lonely girl with a red chalk has the power to create, explore, and eventually finds what she is looking for. Nugget & Fang: Friends Forever — or Snack Time? Ages 4-8. A comical tale about the lengths shark will go to for preserving his friendship with minnow. Ages 3-6. Sweet tale of two sisters, Mathilda and Clemmie on a wet Saturday afternoon. It was the little things is this book that made it so real – Mathilda trying to convince the younger Clemmie of all the wonderful things to do on a Saturday, older one telling Clemmie to get her boots and Clemmie bringing her balloon and then a rubber duckie. These two girls could be any pair of sisters. Story is told in comic strip format. Ages 4-8. Fans of Miss Rumphius will adore this gorgeous picture book which introduces the kind, nature-loving Miss Maple, who celebrates the miracle in each seed. Ages 5-9. A girl learns of her granddad’s immigration story to America through special objects in a collection of matchboxes. Wonderful way to learn history. Ages 4-6. 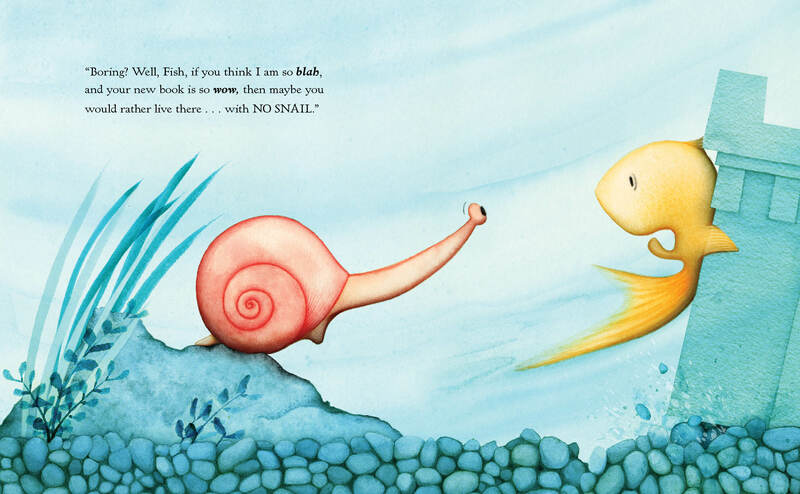 A story about courage in the name of friendship as snail ultimately takes a giant leap and follows fish on an adventure. The art for this work is eye-popping and pushes the boundaries of traditional picture book illustrations to create something truly captivating. Ages 2-6. A simple, wordless tale of kindness brought to life in a wholly original fresh new way of photographing hand-crafted dioramas. Ages 3-7. Wacky, hilarious tale of a box of crayons going on strike. Fun for all ages. Ages 4-8. A lizard uses a pair of old underpants when he runs out of toilet paper. Not a problem until his conscience starts speaking to him. The best part is the ending and I’m not even going to give you a hint. It is PRICELESS! bummer. i feel the same way everytime i see a great title from Europe but can’t locate it in the US. These are GREAT choices, Darshana! Nice list. Grateful I’ve read several of these in recent weeks. Good to hear. Hope you enjoyed them. I haven’t read them all, but have read reviews. Great collection and thank you for the synopsis of each book. You are very welcome. Hope you get to read the rest. 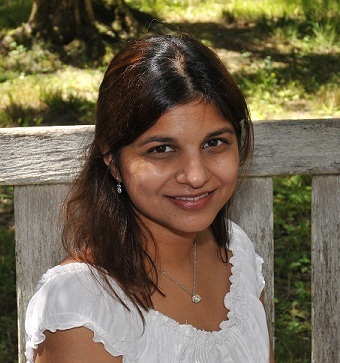 Have read may of these, Darshana – super list and helpful best of categorizations! What an awesome list! Sharing!!! You are very welcome. Thank you for sharing! OMG! After seeing that illustration from Journey, I’ve got to get it! I LOVE lanterns and lights outdoors, beautiful! I’ve also had The Story of Fish and Snail on my radar for awhile. Great list! Yes is the exact reaction I had the first time I saw that scene in the NY Times. You will love Story of Fish and Snail. I kid you not when I say the art is eye-popping. Thank you. Loved your review for No Monkeys No Chocolate. Super list! I’m ordering the lot from the library now. Thanks, Darshana. Yeah, that’s what I like to hear. Hope you enjoy them as much as I did. Oh, I’d missed a few of these. Thanks for the list! Thanks for stopping by Anna. Glad I could introduce some new titles to you. Wow…. I have not read any of these yet…. which is really super sad since I’ve just decided to dig my feet in and rejoin the writing world AND I have a three year old…. I must take this list on our next library visit! Thanks!! That’s okay. I have only immersed myself in picture books the last few years and there are still plenty of classics that I still haven’t read. 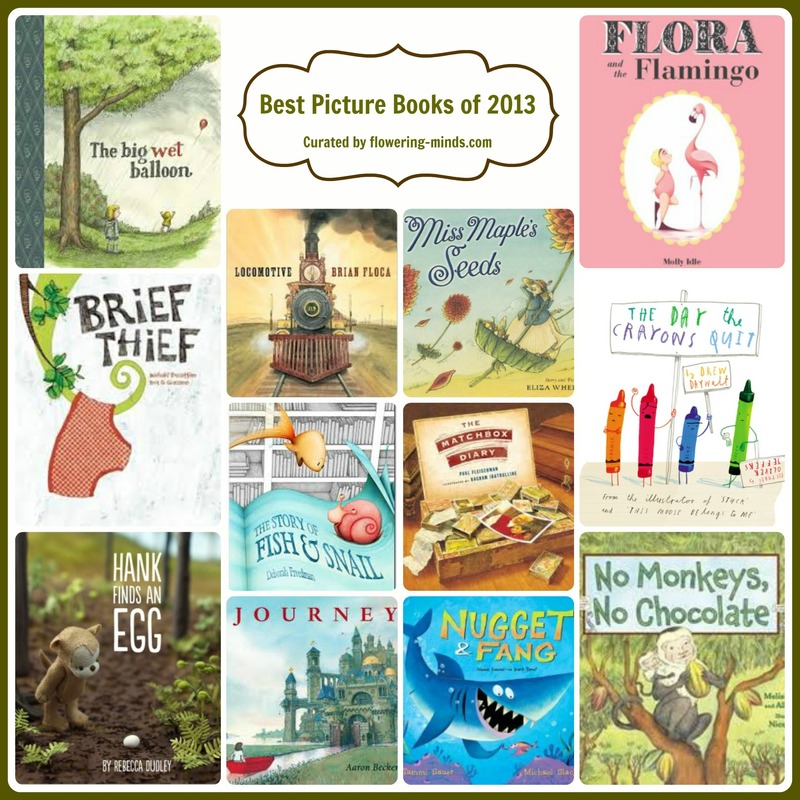 I would recommend also checking out Best Picture Books of 2012. (there is a link at the top of the post) I had a few more titles aimed at younger readers. Enjoy! Welcome Tracy. Glad you enjoyed the list. Eeegaaads .. you call yourself a PB writer ?!?!? Just Kidding 🙂 I am so glad I could help you out. Hope you enjoy the books as much as I did. Happy Holidays! Awesome roundup, Darshana. I’ve not done a good job keeping up with picture books this year, though. So many I still need to read! Thanks Kerry. Hope you are having a wonderful holiday season! Great picks! Flora and the Flamingo is my kids’ favorite! Thanks Dena. I do love the idea and execution of that books – simply perfect! Fantastic Reshama, I am going to hunt in our library for some of these. Thanks for hosting the Kid Lit Blog Hop and have a happy holiday season. Thanks Julie! Fyi – this is Darshana 🙂 Have a wonderful holiday season. Great picks! I need to check out Miss Maple’s Seeds. I haven’t see that one. Hi Jill. I do hope you enjoy Miss Maple’s Seeds. Thanks for stopping by. Fantastic list, Darshana! I love how you organized them into categories. I will definitely be sharing this list. Love your choices, and I want to pick at least a few books from this collection to read! I feel a little sad that my 7 year old is no longer interested in picture book and prefers longer books – I almost have to “force” them on her! Thanks. Totally know the feeling. My 7yr old for the most part won’t touch picture books though she did enjoy THE DAY THE CRAYONS QUIT, NO MONKEYS NO CHOCOLATE, and PEOPLE this year. I think there are picture books for older kids you just have to really search for them. Non-Fiction tends to be a good place since most are written on the upper age range for picture books. I read a few of these with my daughter–and especially loved Miss Maple’s Seeds. It was gorgeous and whimsical. Stopping by from the Kid Lit Blog Hop! Hi Destiny, thanks for stopping by. So happy to hear you enjoyed Miss Maple’s Seeds. I just wish more people knew about that book.